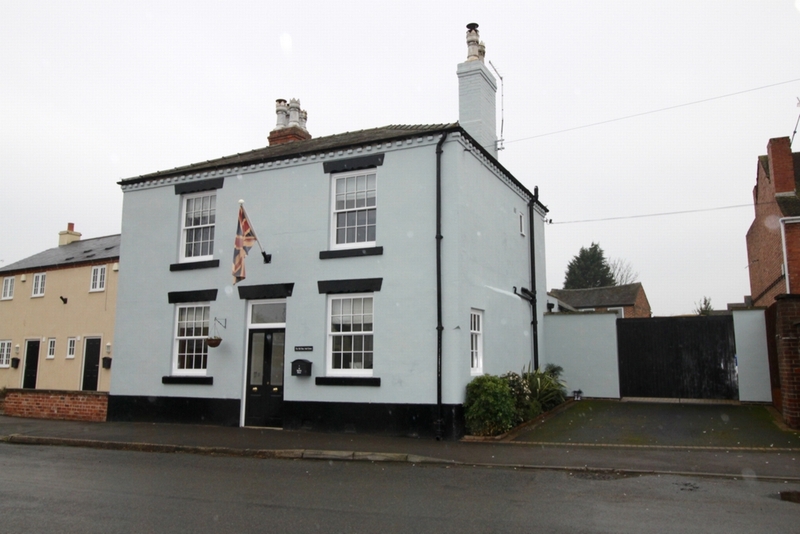 Welcome to the Old Rose & Crown at 52 Market Street in Draycott village. 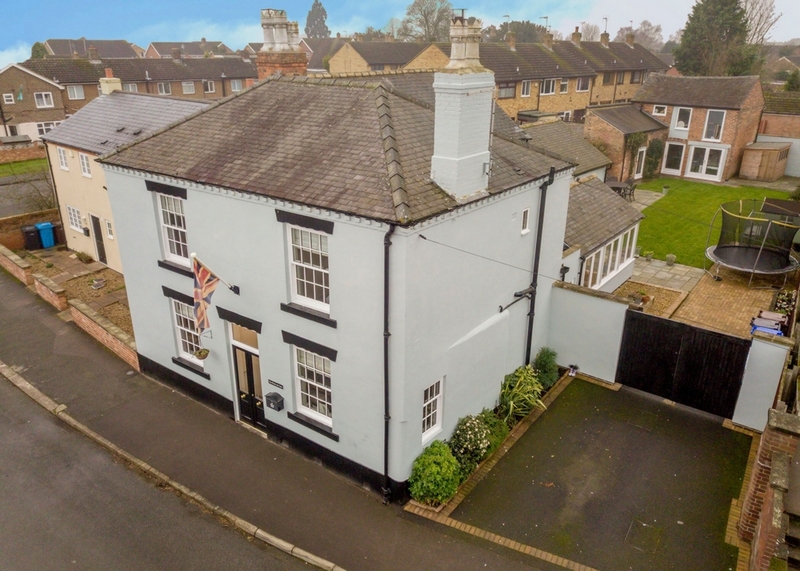 A stunning conversion from a public house to a detached 4 bedroom mansion with five ground floor reception rooms; a master bedroom with ensuite and a separate garden studio that could be easily converted into an independent living annex. 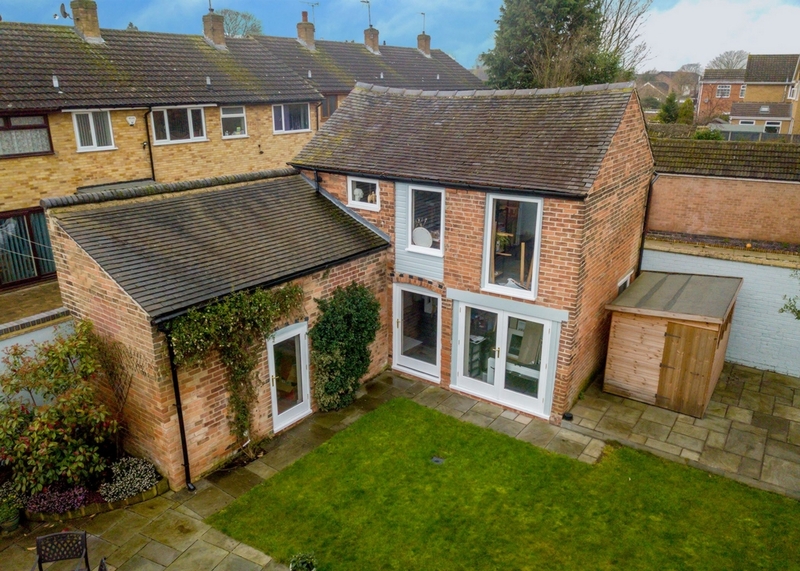 Set in a desirable village conservation area and still having five years builders warranty left, this home has been renovated to the highest standard and nothing has been spared when it comes to quality and craftsmanship throughout. 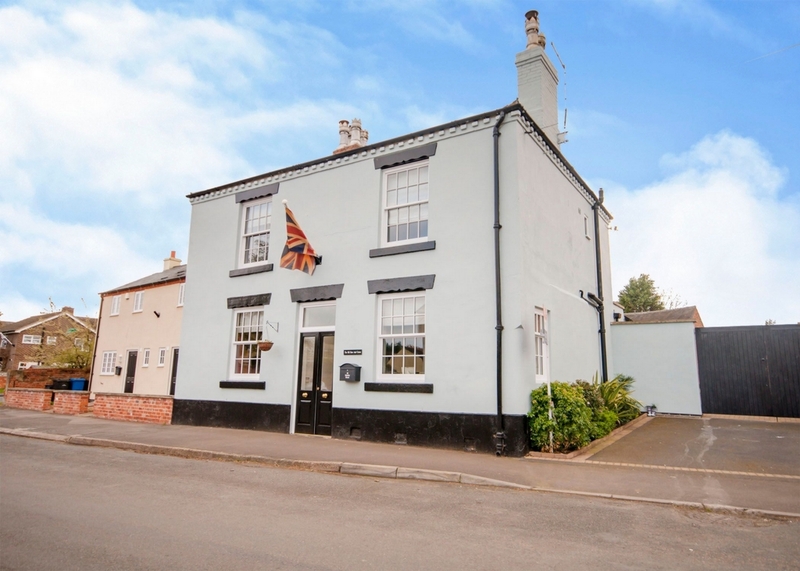 All windows are quality, double glazed, hardwood, replica working sash windows. 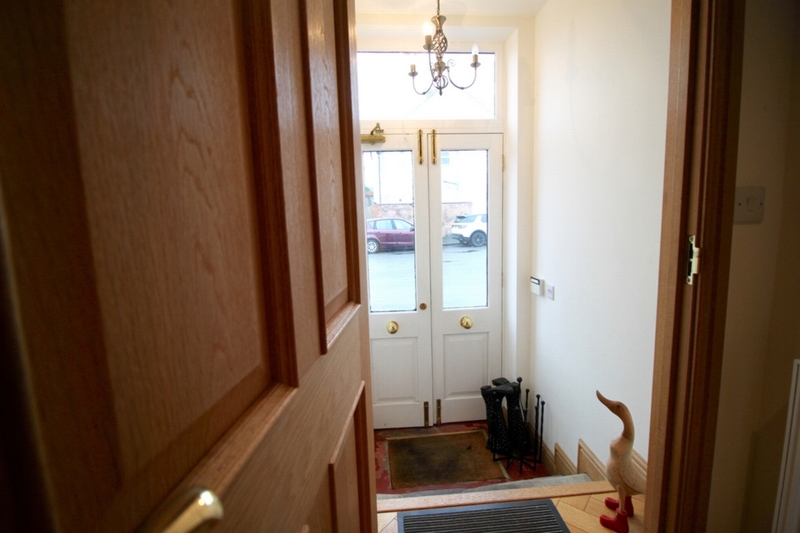 Entering by what was once the Coaching Inn front door with original stone steps, new double hardwood doors on the outside of the vestibule and a new solid oak main front door leading into the hallway with stairs off. 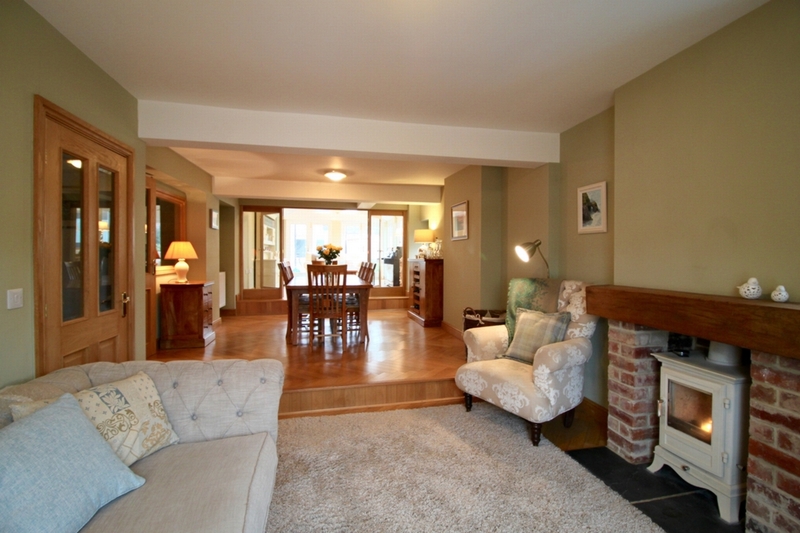 The hallway flooring, as with all downstairs rooms (apart from the kitchen) is in a solid oak herring bone design that is complimented by oak skirting boards and doors throughout. 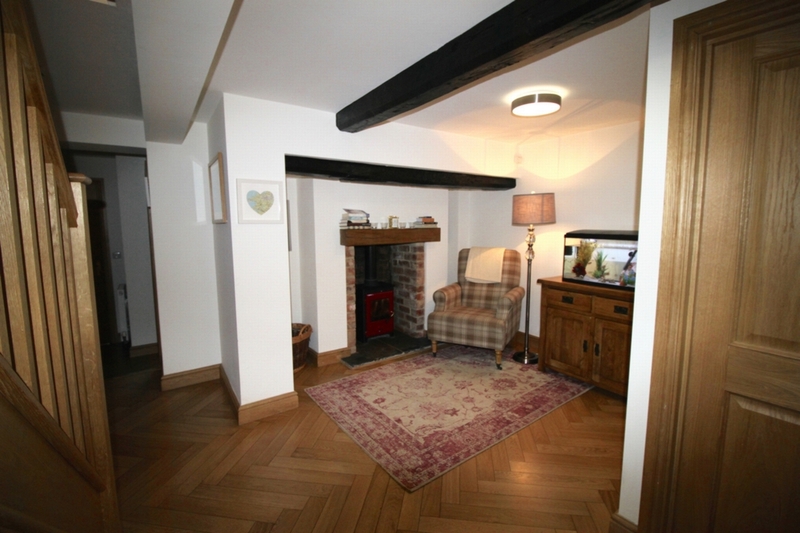 The hallway opens up into a small reading area that has a multi fuel stove beneath the original 18th century oak mantle. 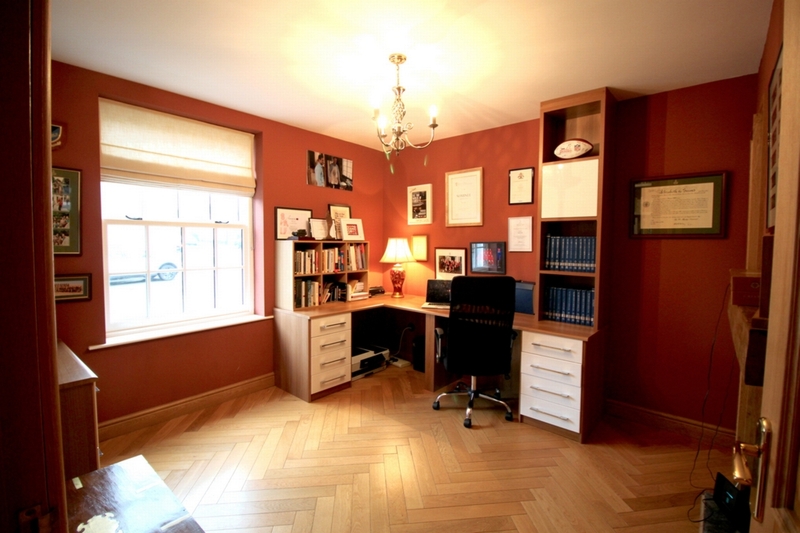 Off the hallway is a very good size study with plenty of built in office book cases and desk. 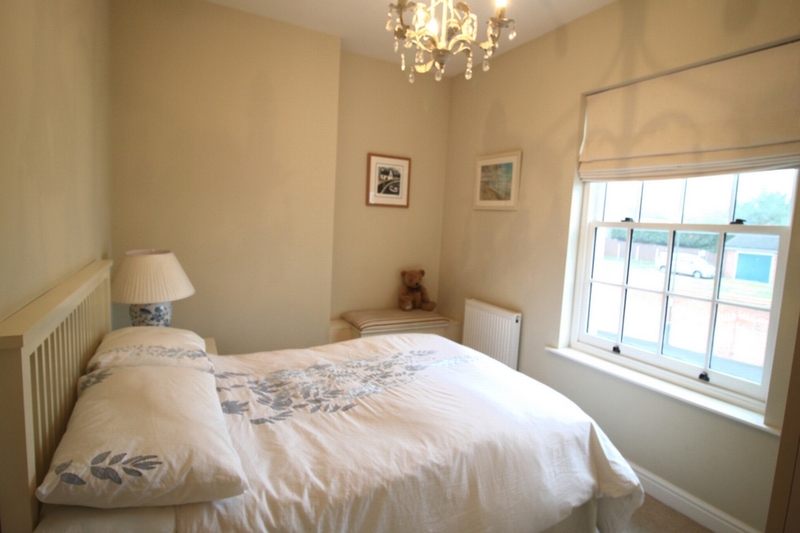 This room has quality replica double glazed hardwood sash window to the front elevation, as with the rest of the house. 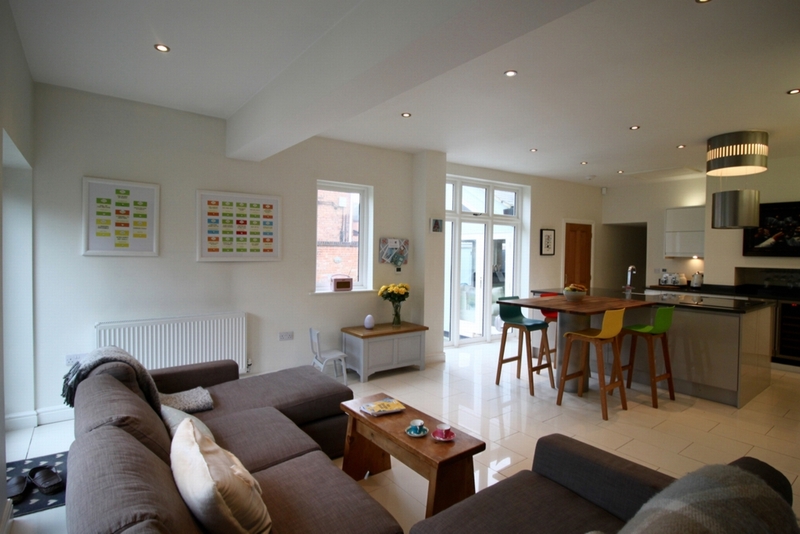 On the right and off the hallway you enter the open-plan lounge, formal dining and family sunroom. 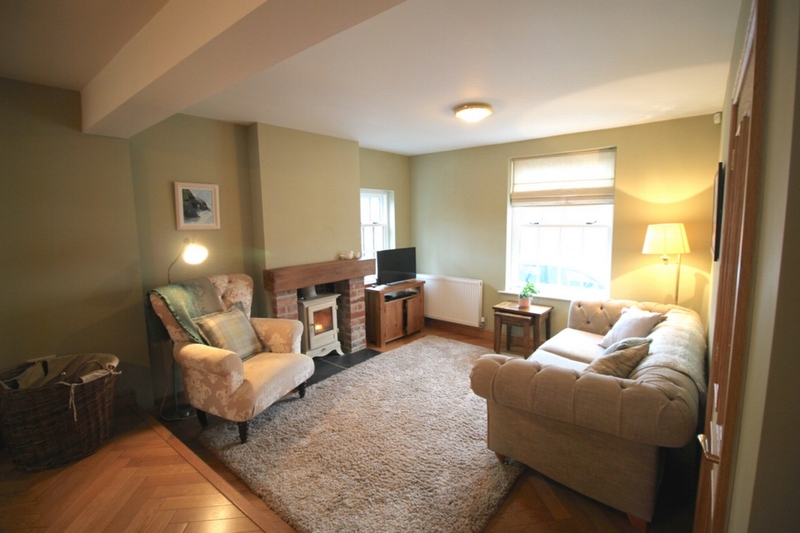 The front lounge has a multi fuel stove sat on slate, with feature brick sides and an oak mantle. The sash window is to the front elevation. 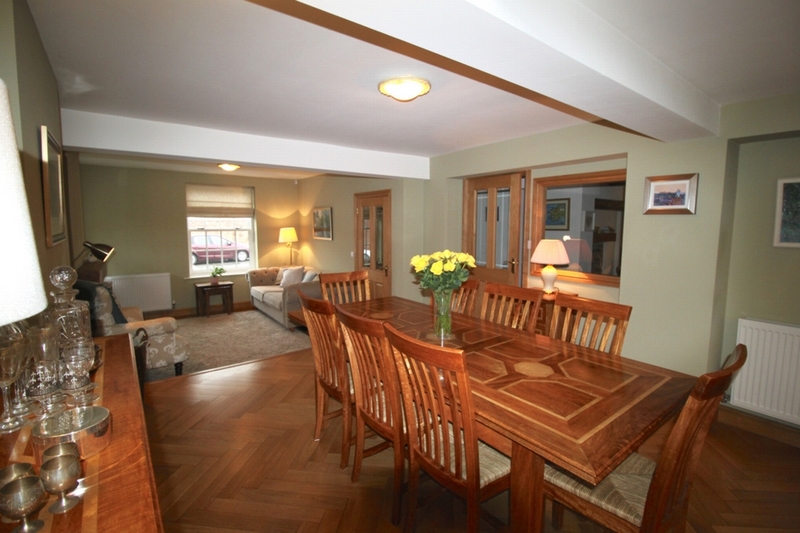 There is a single step up to the formal dining room that has a side elevation window. A double step takes you into the bright sunny family sun room with an apex roof. 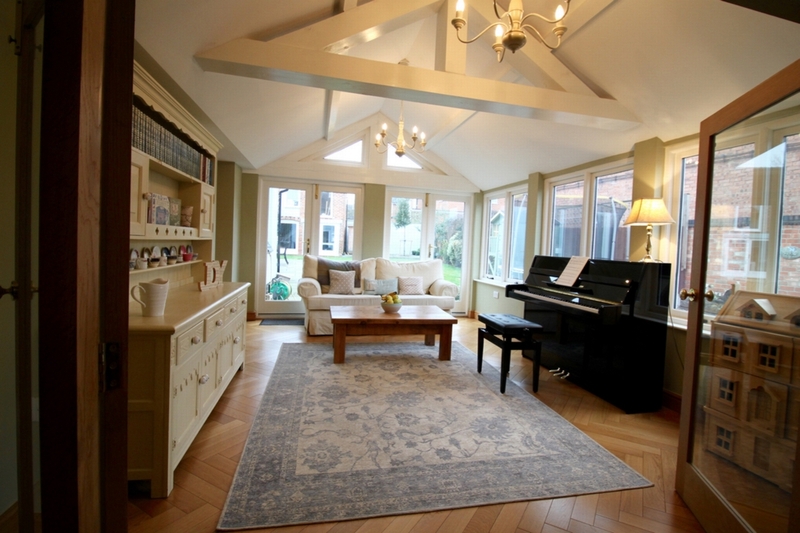 This room has the option of being closed off by the full width oak double doors separating it from the dining room. This sun room has a twin set of double garden doors taking you directly to the outside patio spaces. 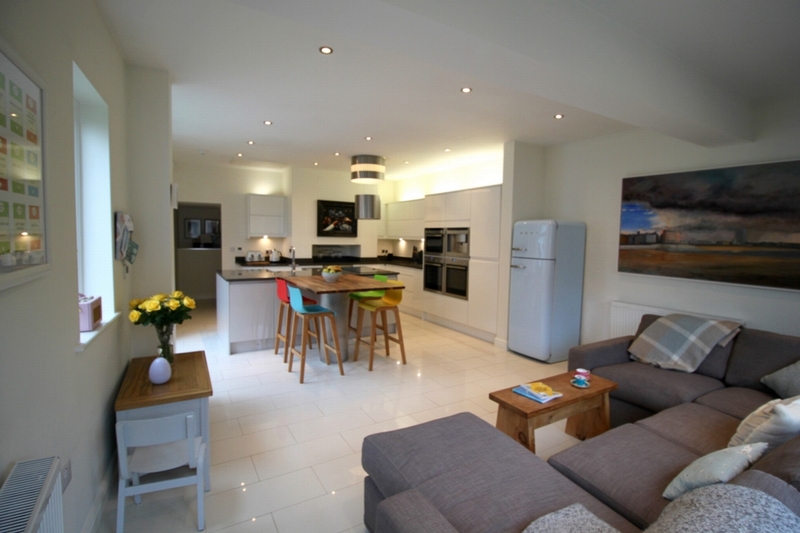 The family open-plan designer kitchen can be accessed from the hall or through the sunroom. 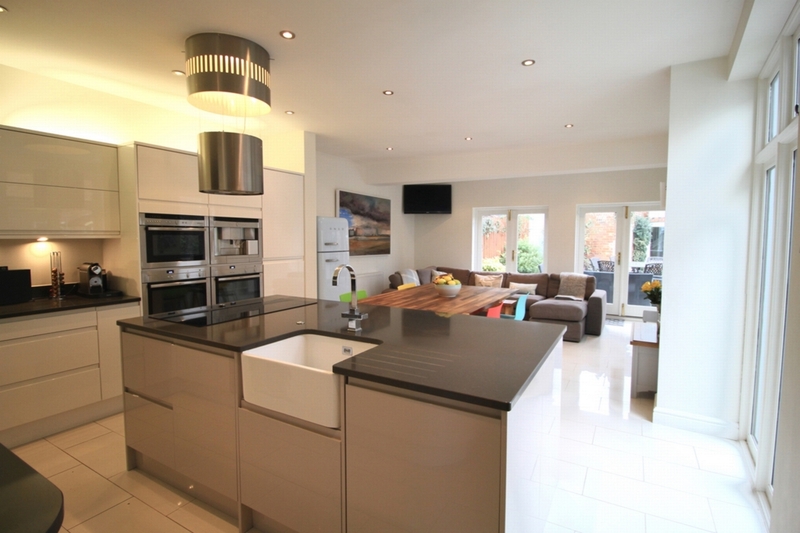 This is a stunning family living space with well laid out facilities and includes a mix of high gloss, white and pale grey units, topped with a grey quartz work surface. All the integrated appliances are quality Neff products and include double ovens and a separate combination oven, an inset Neff coffee machine. There is a large Belfast sink with waste disposal unit and mixer tap, tall cupboard space which can accommodate an integrated fridge freezer if required, full size wine cooler and a five ring Neff induction hob with a designer extractor and island light over. 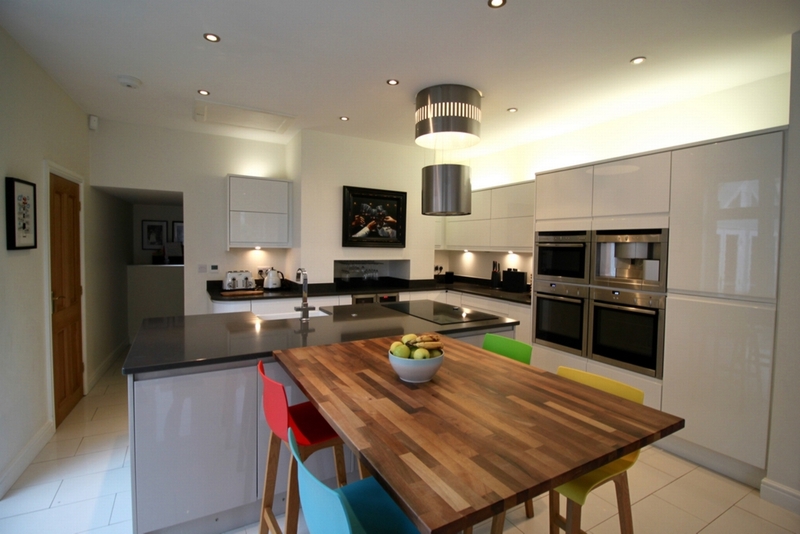 The flooring in the kitchen is a pale porcelain tile from Porcelanosa. 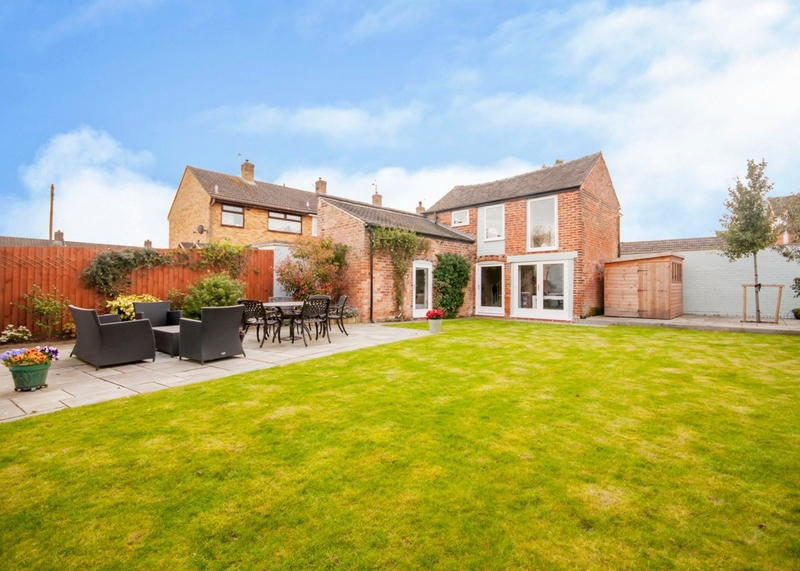 External double doors and full height windows make this a bright room with views to the garden. Also on the ground floor and off the hallway is a guest W.C and a very good sized utility room with plenty of storage and space for a washing machine and tumble dryer and a stainless steel sink. The Worcester boiler is housed in the utility room and has a full service record. 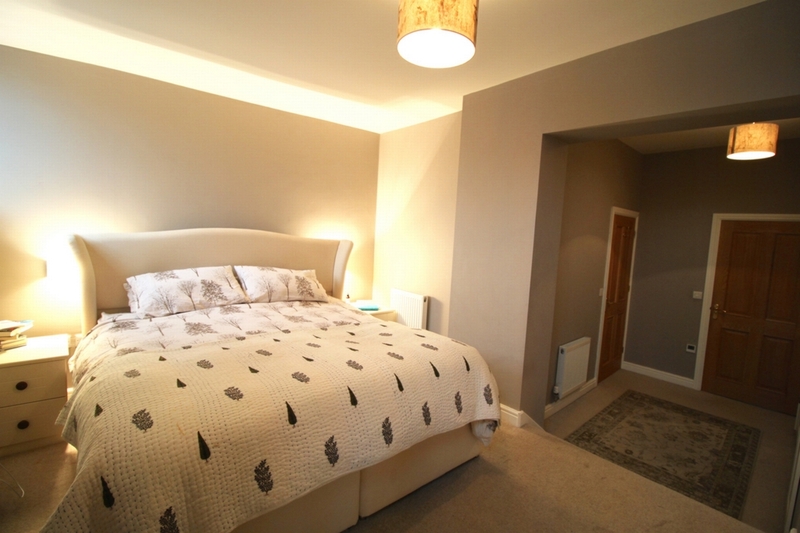 On the first floor there are three double bedrooms and a generous single. 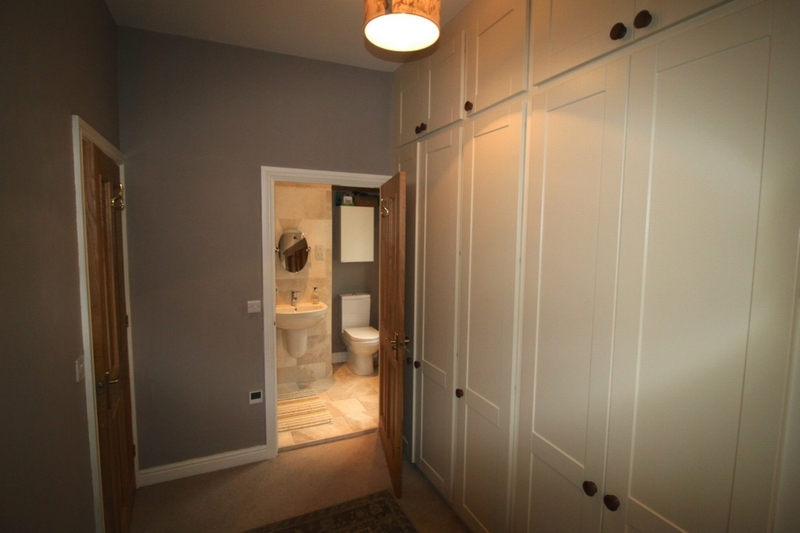 Entering the master bedroom through a dressing area, with floor to ceiling built in wardrobes with the ensuite bathroom off. 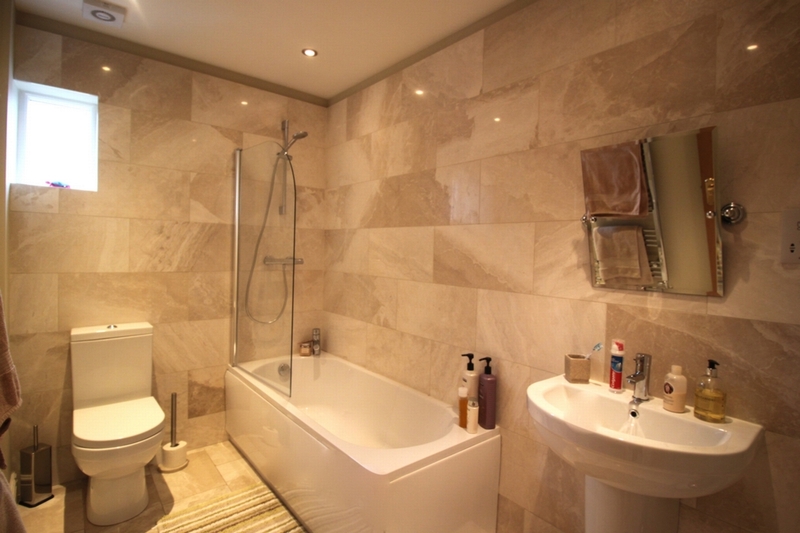 Quality fully tiled in Porcelanosa tiling, wash hand basin and W.C.. The ensuite has a side window. 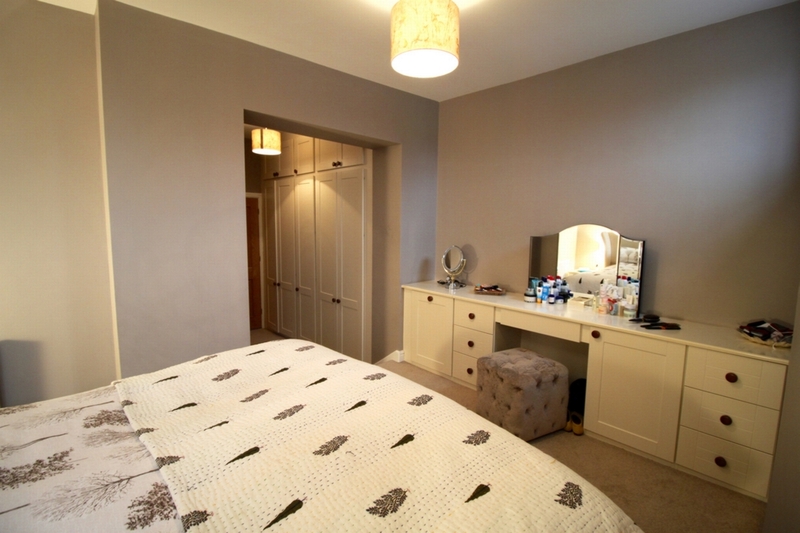 The bedroom area also has a built in dressing table running the length of one wall and offering plenty of storage. This room has a rear elevation window. 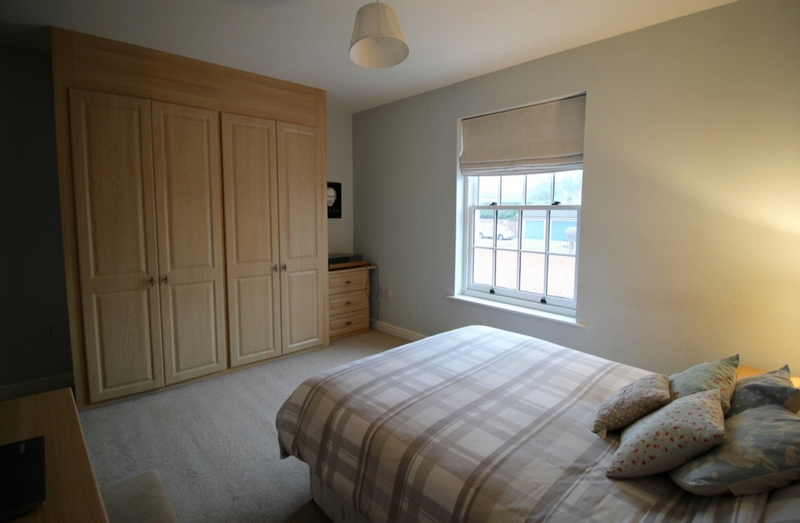 The other two double bedrooms have built in wardrobes offering lots of storage and both have front elevation sash windows. 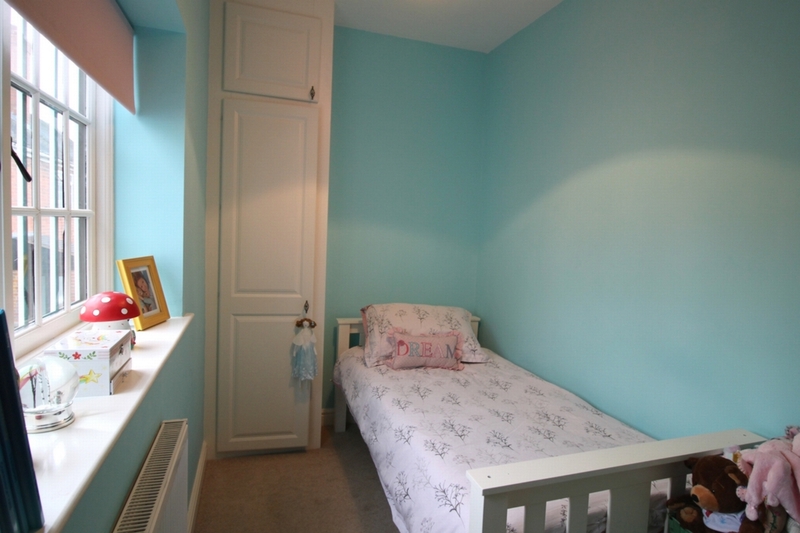 The fourth bedroom is a generous single room and has a narrow built in storage cupboard. 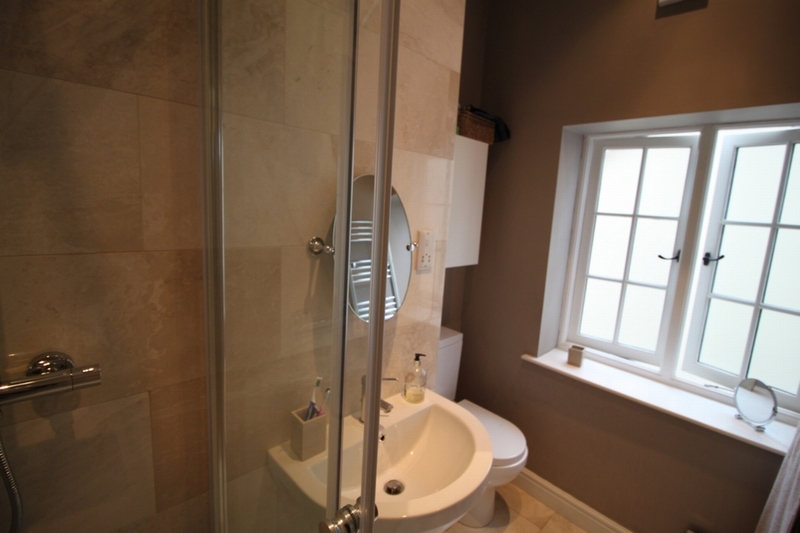 The family bathroom is fully tiled in Porcelanosa tiles and has a full size suite with mains shower over the bath and window to the side. 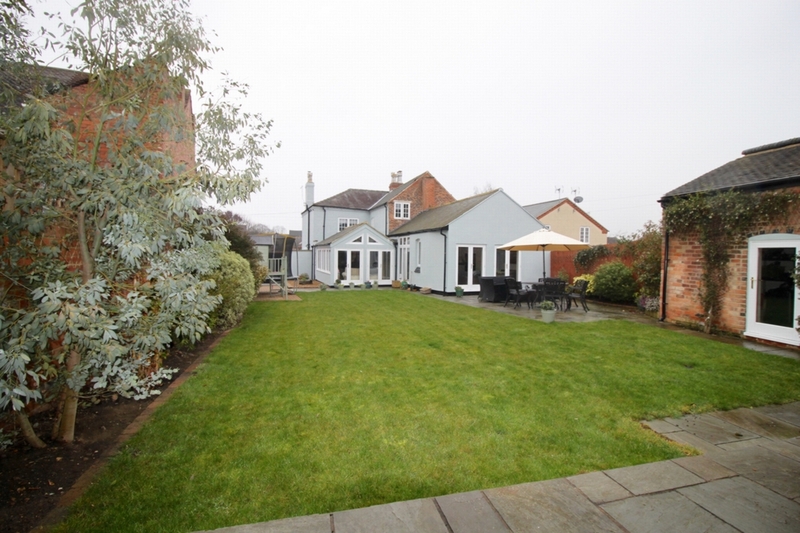 Outside there are double gates to the right of the house with plenty of off street parking for several cars and allowing access to the rear parking and garden. The garden has many mature shrubs and flower beds and two distinct patio areas. 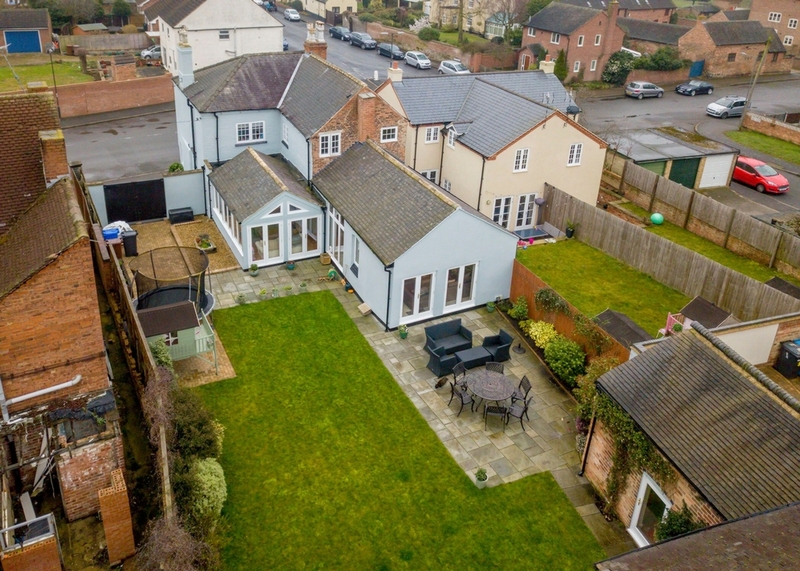 To compliment this stunning property there are two unique out buildings at the bottom of the garden, a single and double story. The large building is currently used as a working art studio with laminate flooring but could easily be converted and used as independent living quarters as it has a working WC and separate sink unit in place. 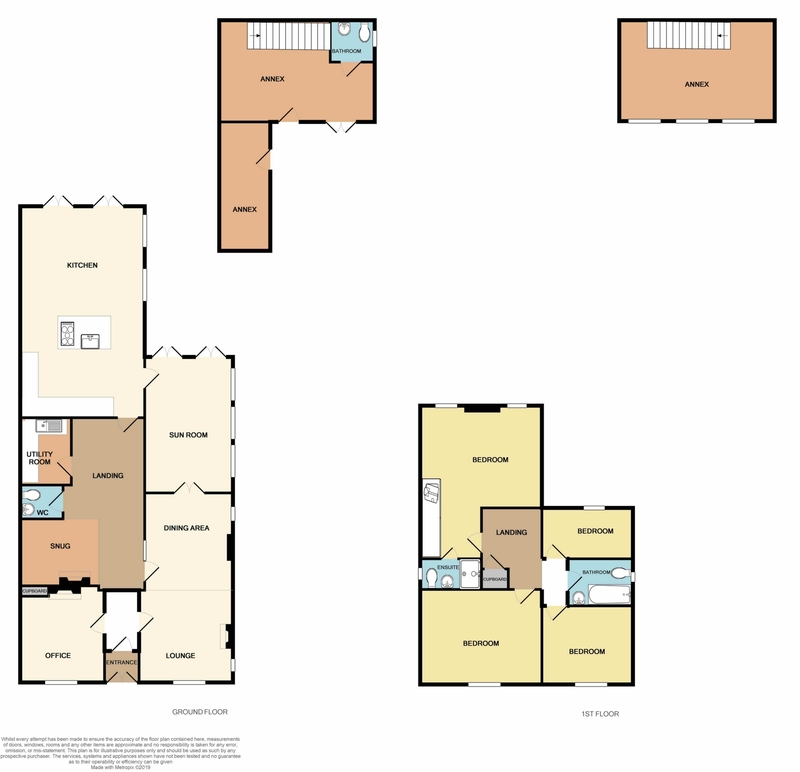 Please note these details form no part of any contract and any floorplans and or measurements are for guidance only.